I love webcomics. There's several that I read, and with their regular rotating update schedule online, every day there's at least one with something new up. I'm sure many of you have webcomics that you read, too. And how many of you would love to have an RPG based on those comics so you can explore the world and interact with the characters therein? I know I'd be up for that sort of thing, and that's just what you get in The Magical Land of Yeld, a new RPG that's up on Kickstarter now that's based on Modest Medusa. In Modest Medusa, a Medusa gets trapped in our world. She's originally from the land of Yeld. That's just where you get to go in the RPG. 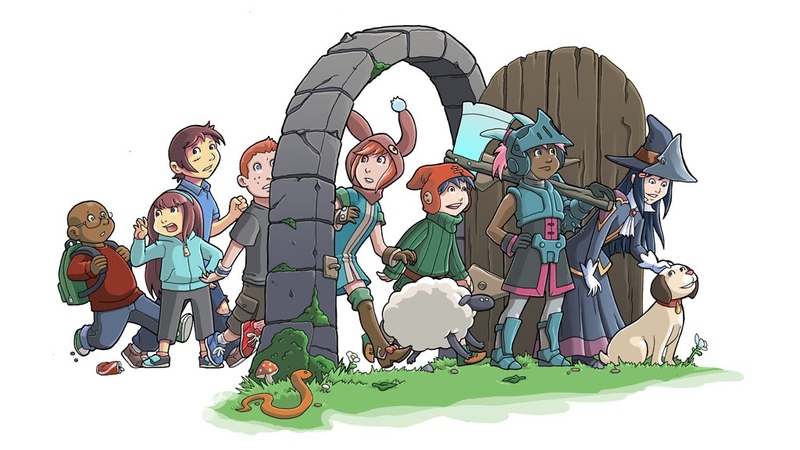 Players start off as a group of Friends that have stumbled upon the gateway to Yeld. So you start out as just normal kids, but as you adventure around, you'll gain levels in heroic classes. The game also has a rotating GM. Each player will GM for a session before passing it along to the net player. That gives everyone a chance to have their own bit of control over the story as well as just relax and play what comes to you. The game uses its own combat system based on pools of D6s where you look to roll better than those you're attacking. Combat also lets you pick which hero or monster goes after you, which is also fairly unique. The Kickstarter campaign is running now. They've made it just over their funding goal, so it's on to stretch goals for the next 28 days.